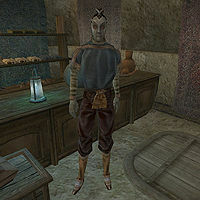 Gadayn Andarys is a Dunmer trader whose shop is located in the center of the Hlaalu canton plaza in Vivec. He is besotted with Eraldil, and has written her a love letter. Gadayn wears a common shirt and an expensive amulet with matching pants, and shoes. Aside from his natural resistance to fire and the sanctuary provided by his ancestors, he knows the spells Divine Intervention, Mark, Recall, Absorb Health, and Detect Key. For the Love of a Bosmer: Find and investigate the source of a love letter from Gadayn Andarys to Eraldil. Depending on how you complete the For the Love of a Bosmer quest, Gadayn's Mercantile skill will either be lowered by 30, or raised by 50, with a corresponding increase/decrease in Disposition, which together will greatly affect the prices of his wares. See the quest page for more details. This page was last modified on 23 November 2018, at 06:14.